Woodruff is a perennial plant, 6-12 inches high; its thin creeping rootstock with numerous matted, fibrous roots sends up many slender stems, which are square, shiny, and glabrous. The soft but rough-edged and bristle-tipped, narrow dark green leaves grow around the stalk in successive whorls with 6-8 leaves in each whorl. The lower leaves are oblong-obovate, the small, white, four-petaled flowers bloom in loose branching cymes from May to June, followed by a leathery, bristly fruit. Makes a good ground cover for shady areas. Has the fragrance of freshly mowed hay. Grows in woods and gardens in Europe, Asia, and North Africa; cultivated in the United States. Often found in the deepest recesses of the forests, where the sun penetrates only with difficulty. Teutonic warriors wore a sprig of woodruff in their helmets in the belief that it promoted success in battle. In the Middle Ages, garlands of woodruff were hung in houses as air fresheners. It is said that Queen Elizabeth I, when she wished to honor an individual with temporary favor, gave him a sprig of woodruff. 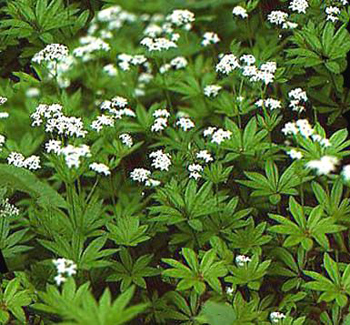 Today in Germany, woodruff is used to flavor May wine. Woodruff tea is a delightful, fragrant tea. Made from green dried leaves. It can be steeped up to an hour. Before the days of insulation and cooling systems, Gerard wrote of woodruff being suspended in houses, in the summer heat, to temper the air, cool and make the place fresh. Traditionally used as an ointment and a perfume. The green plant itself is almost odorless. Germans love this small fragrant herb and have numerous names for it; best known are Waldmeister, Herfreund and Magerkraut. In the 14th century, the plant was used in England and Scandanavian countries to make an herb water for cordials. The plant first appears in print in the 13th century, as “wunderove”, derived, some scholars believe, from the French “rovelle”, a wheel, which refers to the spoke-shaped leaves of the plant. In France, the plant was called “Muge-de-boys”, musk of the woods. In Germany, as early as the 13th century, the herb was used to flavor May wine. The Mai Bowle or Maitrank is served today in Germany and in the German sections of American and South American cities on May Day and thereafter for the rest of the month. Throughout the Middle Ages, woodruff used to be hung in churches and placed in boxes with lavender and roses on special days, such as St. Peter’s and St. Barnabas’ Day. Sweet woodruff is famous for its use with the May Bowl Punch. Steep the leaves and blossoms in one quart of white Rhine wine for a few hours. Add some orange and lemon, strawberries, ice, and more sweet woodruff. Freshly cut sweet woodruff has the aroma of newly mown hay and adds a unique flavor to fresh strawberries. Sweet woodruff is used to flavor certain fine Swiss candies, syrup filled chocolates, liqueurs, etc. A pinch of herb adds a delicate flavor to Oriental black tea. A tsp. of the herb steeped in boiling water from 3-5 minutes, makes a most delicious tisane. Waldmeisterschnaps uses brandy; Waldmeisterlimonaden uses white wine and lemon-ade. There are many recipes for Maibowle. In France champagne is used; in Switzerland, cognac or Benedictine. Anyway, don’t steep the herb too long in order to obtain only the delicate essence of the herb flavor. Sweet woodruff flavored syrup: boil sugar in water to make thick syrup and add enough May wine to flavor. Beneficial for jaundice and recommended where a tendency toward gravel and bladder stones exists. It acts as an anodyne for migraine and neuralgia, and as a calmative for nervous conditions such as restlessness, depression, insomnia, and hysteria. The tea relieves stomach pain, improves appetite, regulates heart activity, and is a diuretic. Old timers state it was used against the plague. It is sometimes used to improve the taste of mixed herb teas. Externally, helps heal wounds. Formerly used as a strewing herb and mattress-stuffer, it still is an ingredient in potpourris and a linen-closet freshener. In Germany, it is used to transform Rhine wine into May wine. Infusion: use 2 tsp. dried herb to 1 cup boiling water; take 1/2 to 1 cup per day. Cold extract: soak 2 tsp. dried herb in 1 cup cold water for 8 hours. The extract can be warmed as desired after straining. Consumption of large quantities can produce symptoms of poisoning, including dizziness and vomiting.